Heat oil in kadai, add cumin seeds, hing , turmeric powder. mix well . add beans, baigan, salt, red chilly powder, mix well . cover with lid and cook for 10 to 15 minutes or till baigan cook. Take one bowl, mix all ingredients, and knead into medium soft dough. Heat Mitti ka tawa. divide the dough into 2 equal portions and roll into bolls, flatten it and spread into small thick roti . place it on the mitti ka tawa and cook on medium heat. keep aside. 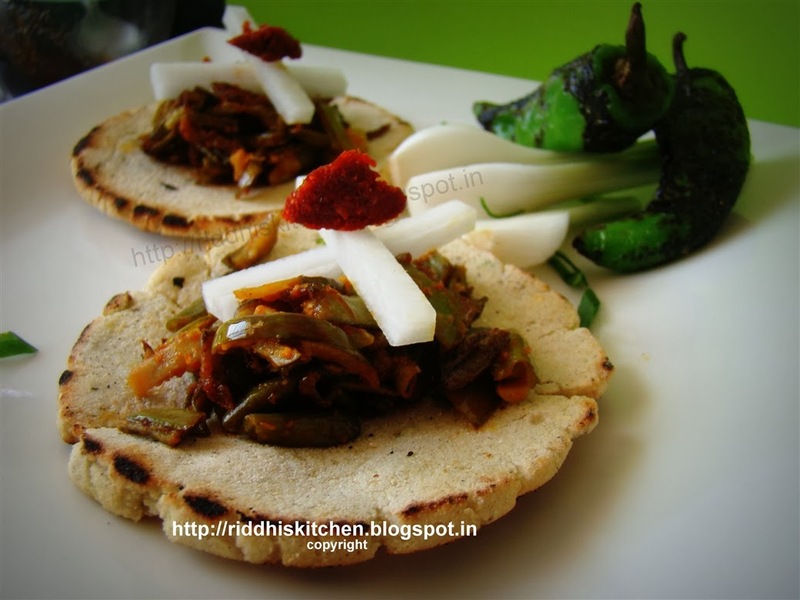 Take serving plate, arrange make ki roti, put 1 tablespoon sabji, garnish with dry garlic chutney , radish, roasted green chilly. Tip : Snow Peas is called "valor" in gujarati language.